Travel theme: Doorways | Oh, the Places We See . 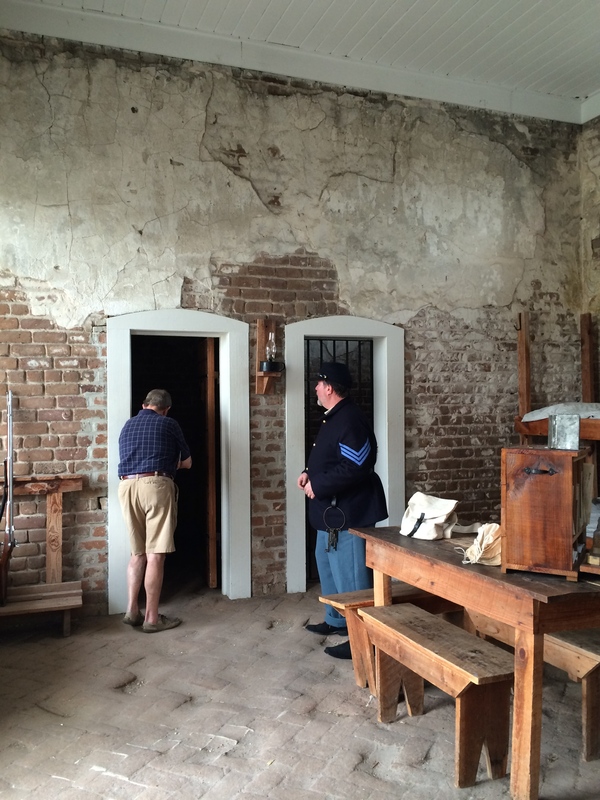 . .
Bert takes a look at a doorway in Fort Clinch. 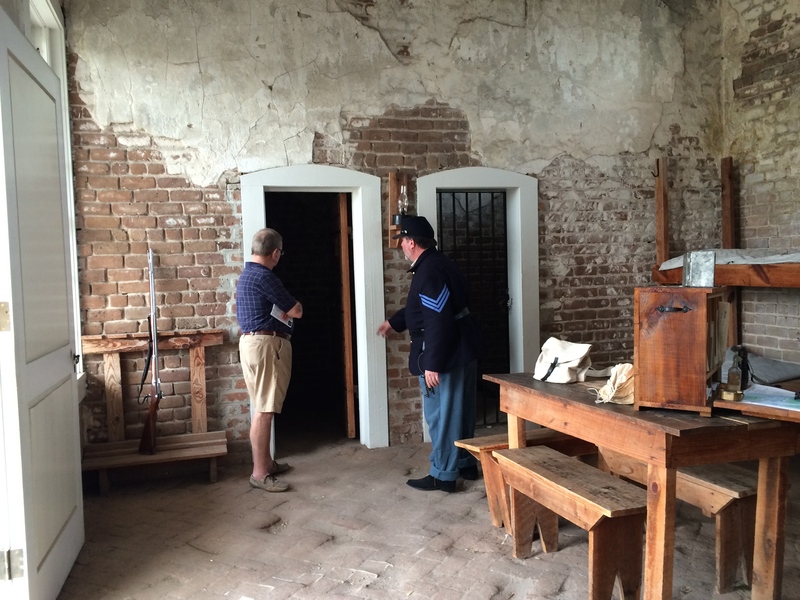 While roaming through Fort Clinch State Park at Fernandina Beach, Florida, on a weekend when re-enactors were not only in costume but also in character, Bert wandered into a spacious room to take a look at an intriguing doorway. 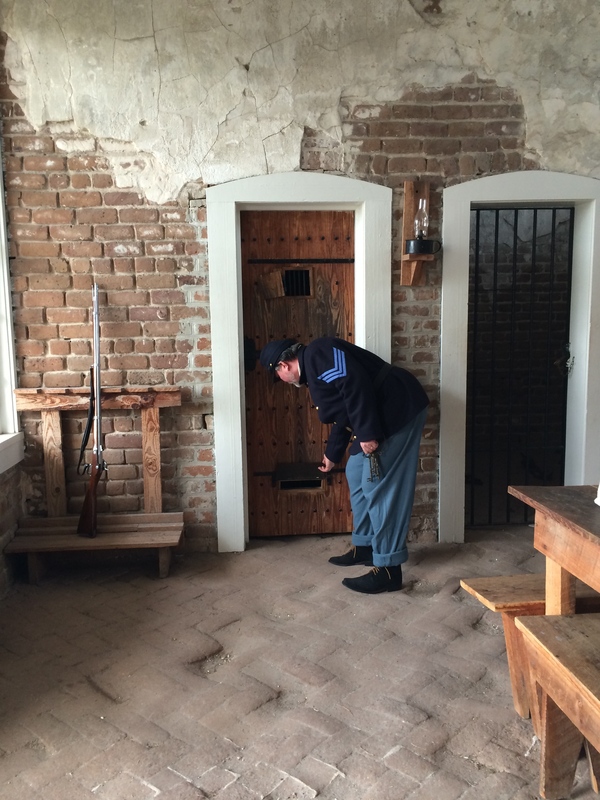 The “guard” moved in, seizing the moment to talk about the prison cell behind the door. Bert takes a closer look, peering into the darkness. The authentically clothed guard then asked Bert if he’d like to go inside the cell. Bert hesitated. But then compelled by his curiosity and the guard’s insistence, my innocent husband wandered in. How does it feel in there? A little small? Immediately, the guard closed the door explaining that he wanted Bert to get the “full experience” of being jailed. Of course, the guard assured him, you do have this little peep hole at the top and a slot where we’ll most assuredly shove your daily ration of bread! For more entries into Ailsa’s Travel theme: Doorways at her blog Where’s My Backpack, click here. This entry was posted in Coasting, Florida, Travel Theme and tagged doorways, Fernandina Beach, Florida, Fort Clinch State Park, jail, postaday, re-enactor, travel theme. Bookmark the permalink. I would have been hesitant too! Was it a bit creepy? I think it must have been. Once I saw what happened to Bert, I just stayed back. That’s one experience I could pass on! True. When Bert came out, he said, “I knew it was just for fun, but I was in there a long time. Began to think something else might be afoot!” Thank goodness it wasn’t! Fun it was! We laughed at the crafty guard who lured Bert into that cell! Thanks for taking a look. They did! But he did say it was a bit claustrophobic!! I can imagine. It must be horrible to be locked up brrr. Have a free weekend! I forgot this challenge anyway! You’re so right — what a tour! And a fun one at that! These are the best kinds of tours. We agree. The guard had quite a sense of humor. It made our tour!!! Thanks for commenting, Dennis.